The other day I received an email from a long time customer asking if I’d consider writing a post on creating a garden bed from scratch. He went on to tell me he has a spot he’d like to turn into a garden like our ‘Better Late Than Never’ garden and wanted to do it right. 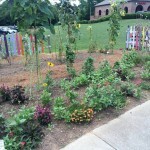 Following are two ways to create a garden bed. I’ll describe each method and let you decide which you would prefer. Each one was created in an area where there had been grass. 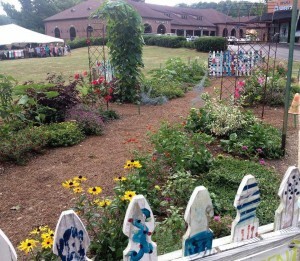 When Oak Street Garden Shop owner Billy Angell created the four garden beds across from the shop, the first thing he decided was the size of each quadrant and how wide the paths between them would be. He was very precise in his measurements, but, since I’ve taken over the garden beds, the sizes have shifted to accommodate self-sown plants. First he killed all the grass in the area by spraying it with the non-selective herbicide, Round-Up. After waiting a week, he spot sprayed again to be sure all the grass was killed. When this was completed, the entire area was lightly tilled and then leveled to make it even. If you’re creating a bed where there are utility lines, always have them located before digging. At this point the actual beds were measured and marked off. There would be 4 of them, each 6′ wide and 20′ long with 3′ wide pathways between each bed. Next, each of these beds was deep tilled, using a bobcat equipped with a tiller attachment on loan from a local landscaper. Now it was time for the final amendments. 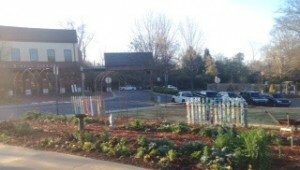 A truckload of 1/2 compost from the city of Mountain Brook and 1/2 coarse builder’s sand was unloaded on the sidewalk in front of the soon-to-be garden. Wheelbarrow by wheelbarrow the compost and sand was spread evenly over each bed. 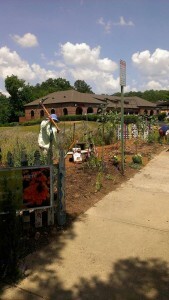 It was tilled one more time, then graded so each bed sloped slightly toward the walkways. Billy sent a soil sample to Auburn, and about a week later they had the results. We were prepared to adjust the soil depending on what the findings were. Amazingly, they said the soil was near perfect and no other adjustments were necessary. 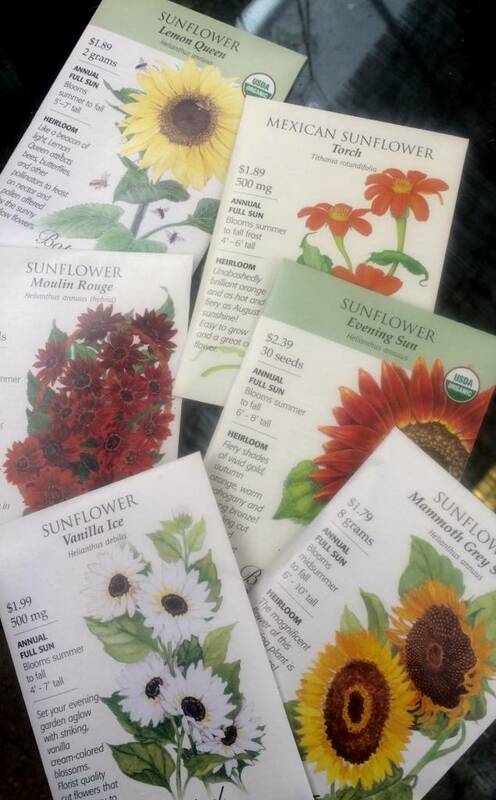 You can obtain these soil test kits from the Birmingham Botanical Gardens Extension Service office. 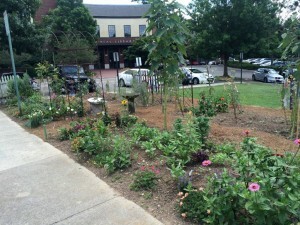 Each season the beds are top dressed with soil conditioner and PlantTone and regraded. 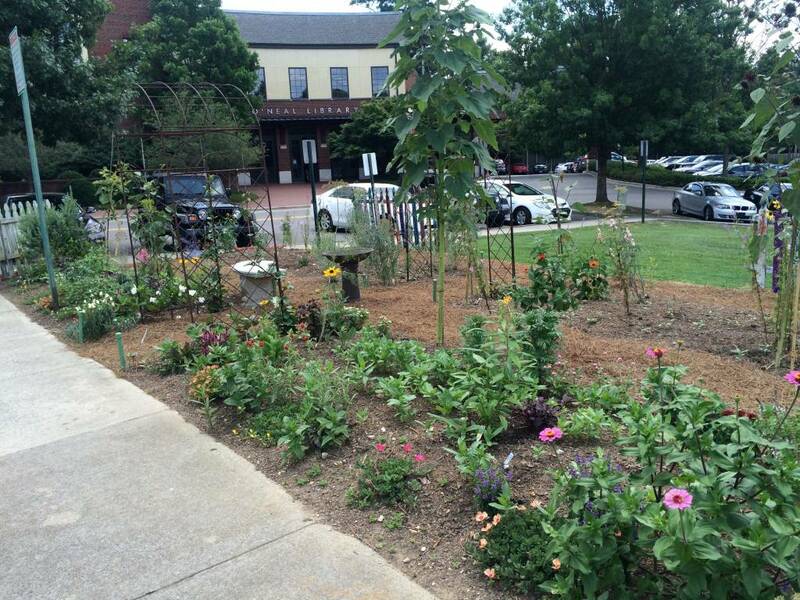 Weeding is done by hand, and no chemicals are applied, in keeping with its designation as a pollinator garden. 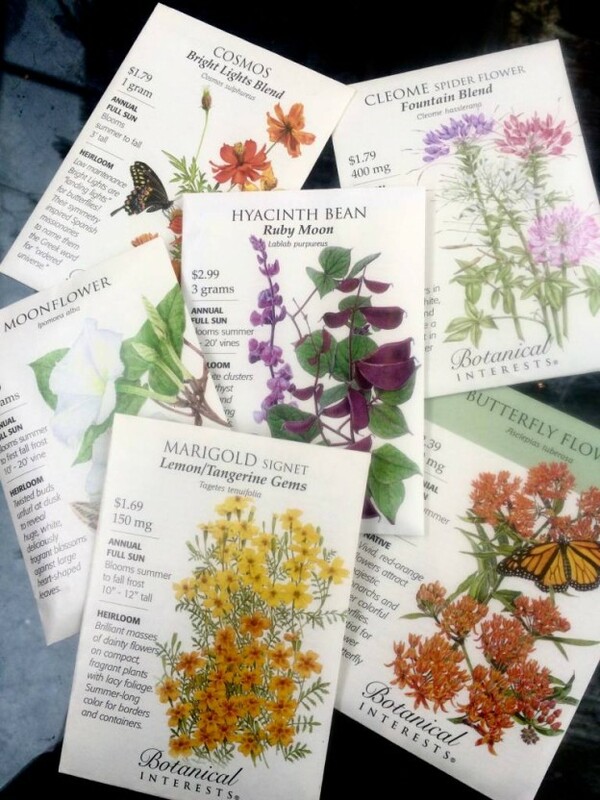 In addition to plants that reseed each season (zinnias and sunflowers in the summer, bachelor buttons and larkspur in the winter), transplants from the garden shop are also added. 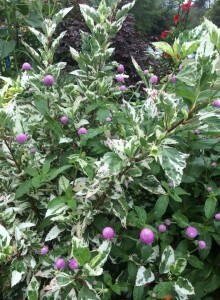 For more on plants in the summer garden look HERE. 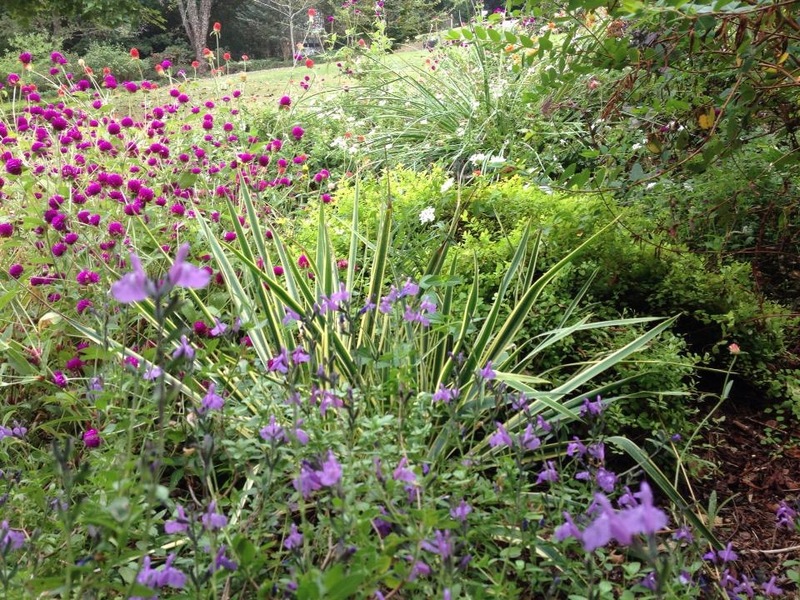 At home, my husband and I have created many beds, the largest one in front of our house that had been weedy grass. In our beds my husband first dug out all the grass by hand, working in one small area at a time, shaking all the loose soil off and discarding the grass. Rather than tilling the soil, he took a large pick-ax to break it up, loosening it and then removing any remaining roots and weeds by hand. The cleared area was then raked smooth. Following this, he applied layers of newspaper, wetting each area down, then covered the paper with soil conditioner purchased in bags from the shop, and home made compost. We left these areas through the summer, hoping to kill any remaining rootlets of grass and weed seeds. 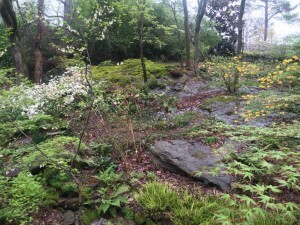 I began planting a few things that fall but waited until the following spring to begin planting in earnest. I continue to pull weeds that appear and keep it well mulched as well. Each season we add more shredded leaves and compost, and the soil has become looser each season. 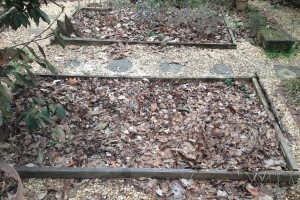 Whichever method you use, remember that creating a garden bed doesn’t end when the initial work is done. Good gardening practice is to continue to add nutrients to the soil as our hot temperatures break soil amendments down very quickly. The easiest amendment makes use of our fallen leaves each autumn. Run over them with your lawn mower and add them to your beds. 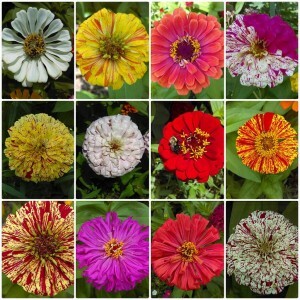 If you are beginning a pollinator garden with summer annuals and would like to sow seeds, be sure to wait until any danger of frost is past, then sow heat lovers like tall cutting zinnias directly in the ground. Be sure to keep seeded areas moistened until the seedlings show, then water as necessary as plants become larger. 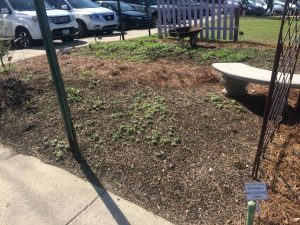 Creating a garden bed by either method requires a good bit of initial labor, but the end result is worth the effort! 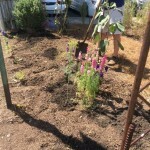 This entry was posted in community garden, Garden Preparation, Planting Tips and tagged better late than never garden, community garden, creating a garden bed on February 14, 2017 by Kris Blevons. The pretty but very shy bright yellow goldfinches that have found the ‘Better Late Than Never’ Pollinator Garden across from the shop were still coming to the last of the bachelor buttons, larkspur, and some sunflowers that had seeded from last year’s plants when Bert and I began prepping the four beds for a new season mid-June. The beds needed some additional organic matter, and we added bag after bag of topsoil, soil conditioner, and PlantTone to each. Bert and I took turns with my heavy pick axe, each strike of the tool working the amendments in without turning the soil, since that would only turn up buried weed seeds to the light where they’d happily germinate and grow. Then I took a garden fork and loosened it even more. Any good garden begins with this all important work. Remember this in your own and always add more to your soil before replanting for the new season. We usually have bags of soil conditioner and topsoil in stock, and the PlantTone is a great organic amendment that adds nutrients too. Finally the beds were ready for planting. After raking the beds smooth, it was time to sow the zinnia seeds in the two front beds. I also added lots of plants. Tall cutting marigolds from a small grower north of Birmingham, tall purple and red gomphrena, a beautiful deep purple salvia and peach porterweed for the hummingbirds, angelonia, pentas, purslane, ornamental okra just for fun, pink mandevilla and malabar spinach vines on the two arbors, as well as seeds of moonvine and hyacinth bean to climb them too. A few weeks later the last of the bachelor buttons and larkspur were pulled out, and the back two beds were planted with lots of sunflowers and tithonia, the orange flower the monarchs loved last year. 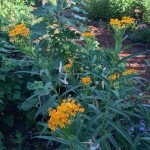 I noticed that a yellow lantana and perennial butterflyweed had come back from last year also. 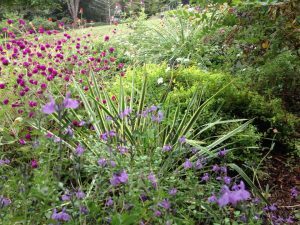 Of course the old fashioned Cleome, or spiderflower, had reseeded, but I also added another, shorter variety and a few more perennials this year, including coneflowers and caryopteris on each corner of the two back beds. 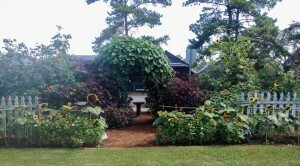 Just as plantings change and evolve with the years, so do structures in the garden. Pinkie painted the back fencing white this year, and we added a trellis piece painted a beautiful blue. I think we should try to grow sweet peas on it this fall, though I’ll have to tie string onto it for them to climb on. The days have passed. 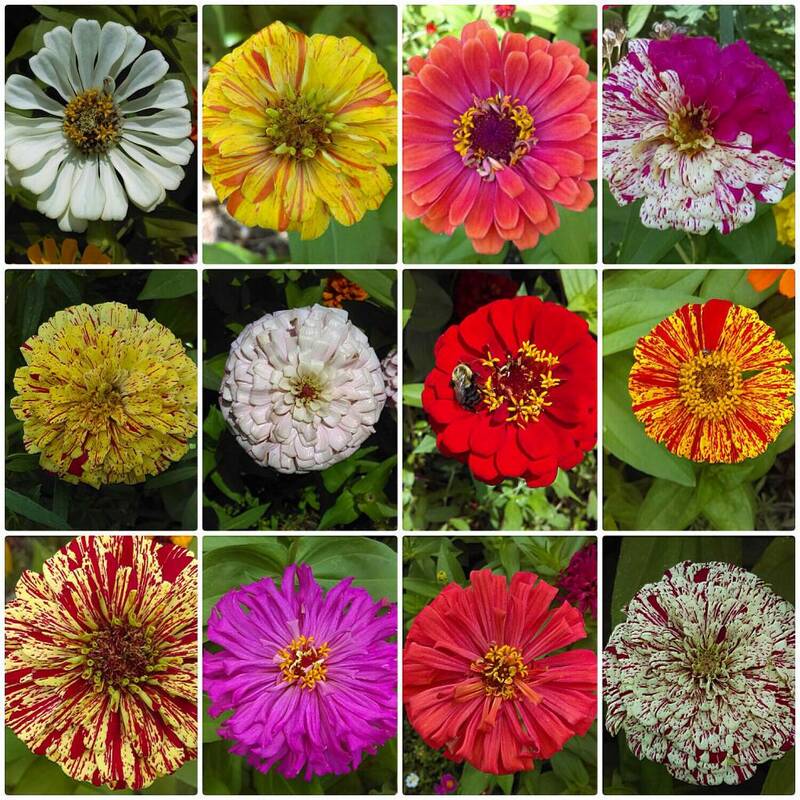 It’s now August and the true heat has settled in; the zinnias love it and are in a riot of bloom: California Giants, Cactus, Peppermint Stripe, Northern Lights – beauties every one. Watering, pulling stray weeds, and deadheading are the important chores on hot summer days, but sometimes I have to stop and simply watch. I see tiny skipper butterflies, bees, and even a garden spider weaving its web near the arbor and bench. 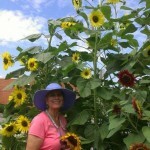 The sunflowers and tithonia will be blooming soon. 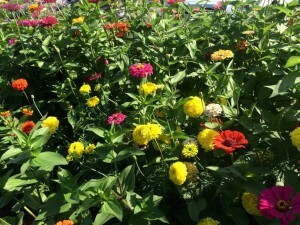 They were planted a few weeks after the zinnias. I look forward to these towering bee and goldfinch magnets, in every color from pale yellow to deep red, and the brilliant orange flowers of the tithonia too. 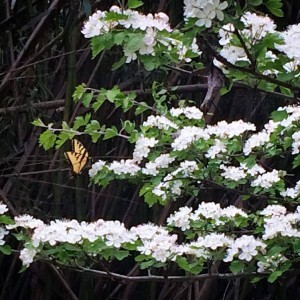 And, just the other day I threw out some seed of tall yellow cosmos, another butterfly flower. The garden will reach its exuberant crescendo in the coming month before beginning a slow descent into fall. 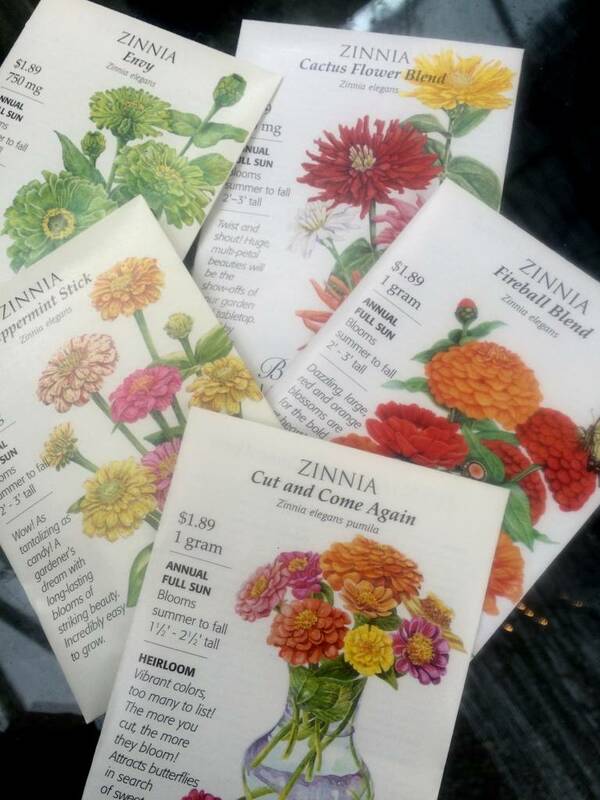 The zinnias will most certainly get mildewed leaves, and the heavy sunflower seed heads will droop on sturdy stems. But for now, it’s summer, and the garden is glorious. This entry was posted in Annuals, community garden, Flowers, Garden Preparation, Planting Tips, Pollinator Gardening, Summer, Weeds and tagged better late than never garden, better late than never pollinator garden, cleome, community garden, cutting zinnias, flowers for butterflies, garden prep, gomphrena, spiderflower, sunflowers on August 6, 2016 by Kris Blevons. On a gray, cold day in the middle of February, the promise of a beautiful spring and all the summer days to follow arrived in two nondescript boxes. 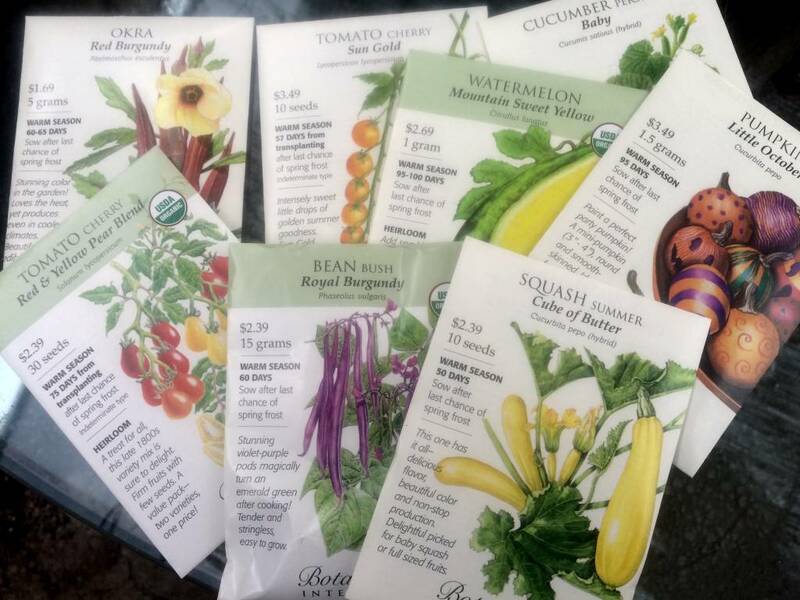 Tearing them open, I looked at brightly colored seed packet after seed packet of herbs, flowers, vines, and vegetables, and began sorting them out. This was easier said than done, as we’re still in the midst of a major rearrange of the greenhouse, moving our work/design area from one end to the other, in the process cleaning, painting, reorganizing, and generally going through the proverbial “mess before it gets into some semblance of order” phase. Jamie and I had prepared though, setting up seed racks by the front table where our garden shop cat, Liam, likes to sleep. I pulled all the fall “cool season” seeds and set out a 50% off sale sign on them. Purchasing them now at a discount is a smart move. Keep them cool and dry, since humidity and warmth may shorten a seed’s shelf life. Knowing this, the best way to store any seed you purchase is in plastic food storage bags, glass jars with tight fitting lids, or any other container that will stay sealed. Place them in your refrigerator (Not the freezer!) until you’re ready to use them. 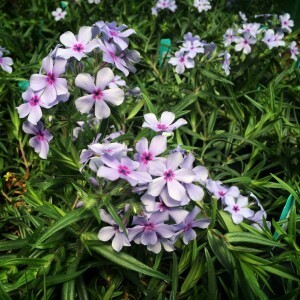 Once you’ve browsed the sale seeds, don’t forget to check out this season’s selection for your summer flowers and vegetables. I’ve already set aside some of them for the Better Late Than Never Garden – assortments of tall cutting zinnias, sunflowers, tithonia (Remember the tall, beautiful orange flowers that bloomed late in the season? 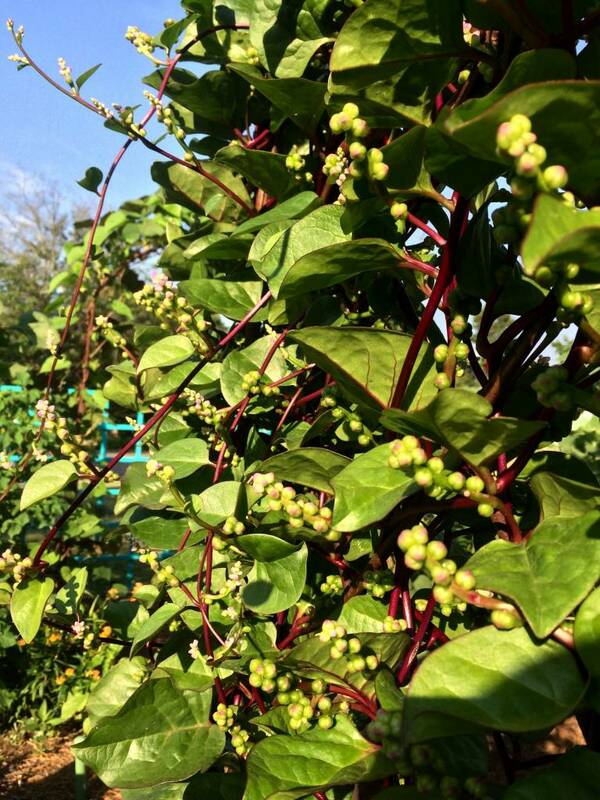 ), spider flower, moonvine, ‘Red Burgundy’ okra (It’s ornamental and edible!) and more. I’ll be putting them in my refrigerator at home until I sow them sometime in late spring/early summer. Of course there are many things that can be started inside under grow lights or in a greenhouse much earlier, and this can be a fun and educational project for anyone with children. Simply follow the directions on the seed packet to ensure success. It will say how many days to sow before or after the last average frost (For us, that magic date is April 15th.). Knowing that will help you start your seeds at just the right time. So plant some seeds this year. You just might be surprised at what comes up! 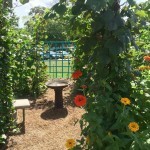 This entry was posted in community garden, February, Flowers, Garden Preparation, History, Seeds, vegetable gardening, Vegetables, Vines and tagged botanical interests seeds, spring flower seeds, summer vines to start from seed, vegetable seeds for summer on February 9, 2016 by Kris Blevons. The “Better Late Than Never Garden” is living up to its name again this year. 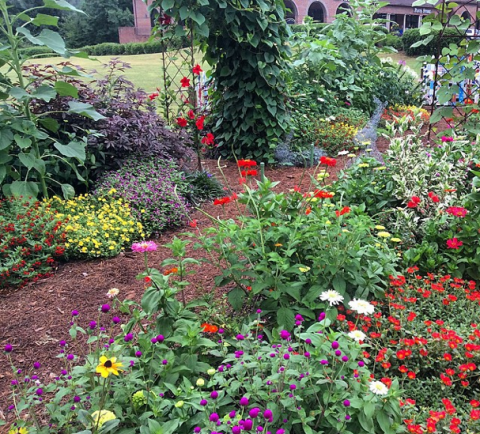 It was just about a year ago, at the end of June, 2014, that the garden was planted with sunflower, tithonia, hyacinth bean vine, and zinnia seeds, along with a myriad of assorted plants that were still in stock late in the season. This year is right on track as the tired snapdragons, foxglove, delphinium, and the last of the very worn out pansies, barely hanging on in the summer’s heat, were finally pulled out and tossed into the compost. 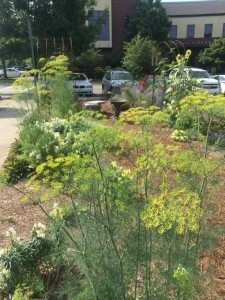 We left the dill that had bolted and is now in flower to continue blooming. 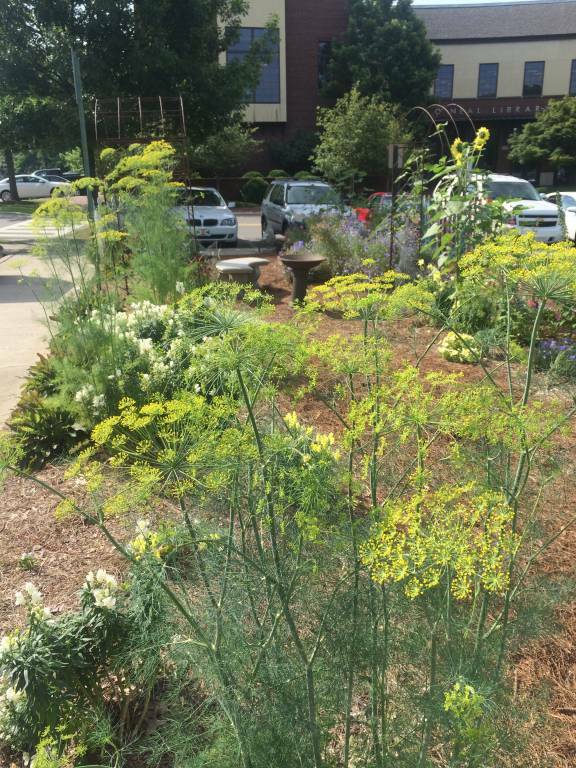 Blooming dill always reminds me of my grandmother’s garden. She always let it go to seed and used them for dill pickles. Gardens are sometimes as much about memory as the here and now, aren’t they? 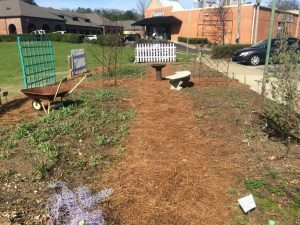 I surveyed the four beds after the winter’s pinestraw mulch had been raked off, the beds amended with PlantTone, and finally a layer of soil conditioner had been lightly raked in. So nice and neat, I thought. We are ready to begin a new season! 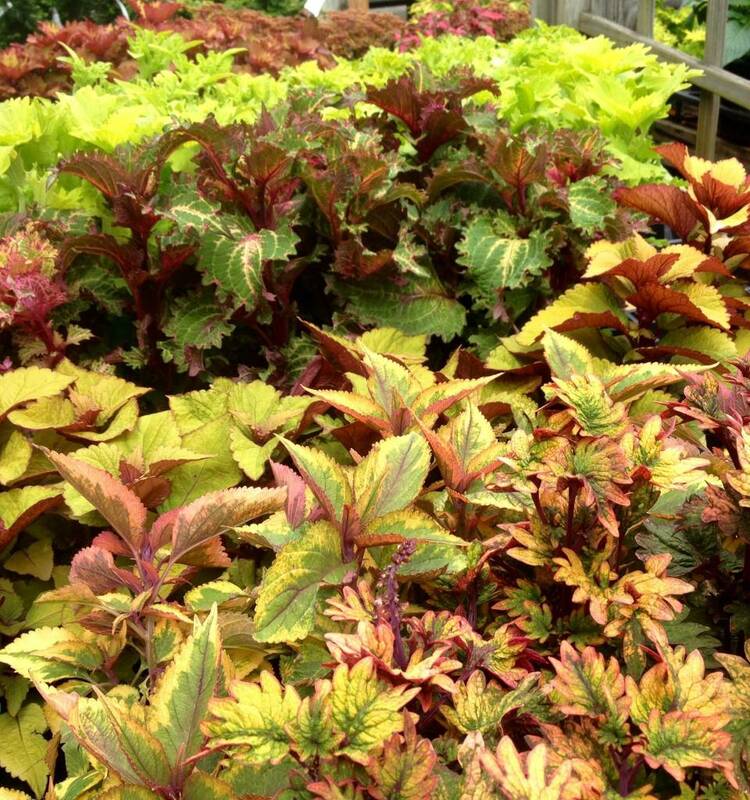 Stay tuned for more posts on this season’s planting adventures. This entry was posted in community garden, Garden Preparation and tagged better late than never garden, community garden, emmet o'neal library community garden on June 21, 2015 by Kris Blevons. The ‘better late than never garden’ is certainly living up to its name, since it was planted at the beginning of November 2014, and most of it finished just prior to the hectic holiday season, a full month later than I would have liked. This ‘better late than never’ schedule is working out okay so far, though, as the plants are growing steadily. Of course, more updates will follow, documenting successes and the inevitable failures that every garden and gardener has. Most of these pictures were taken quickly very early on a mid-December morning in the middle of the holiday rush. Since there were other things that needed to be done, I couldn’t linger; but now, with the new year and more time, here’s an overview of the planting process and selection in this ‘better late than never’ winter garden. Let me admit right off that I’m not a “garden designer”. 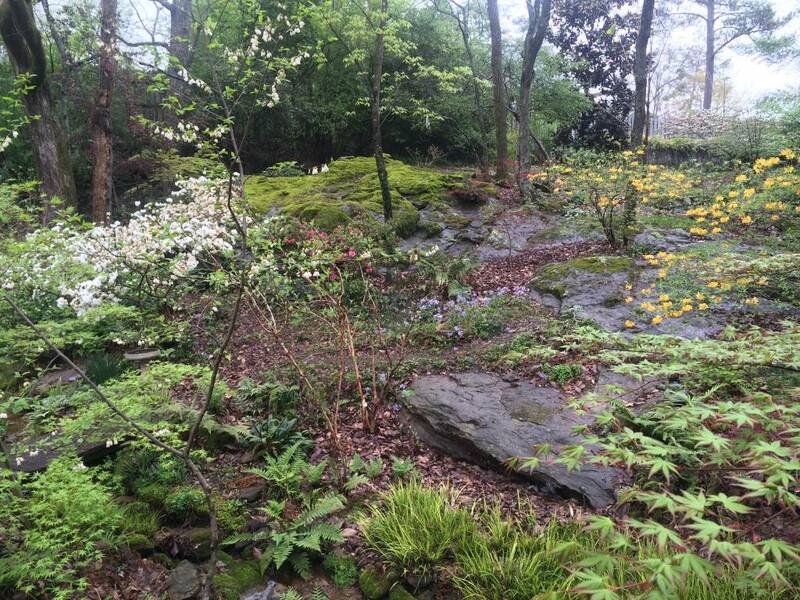 I can’t tell you that I drew a beautiful rendering of what I envisioned this garden to be come spring. No, the reality is that I grabbed a few packs of this and a few pots of that (usually in the middle of a busy day), raced across the street trowel and plants in hand, and plugged them in wherever I felt they worked best. So, in that way, little by little and over and over, the garden was planted. Time, attention, and the weather will determine how it turns out this spring. 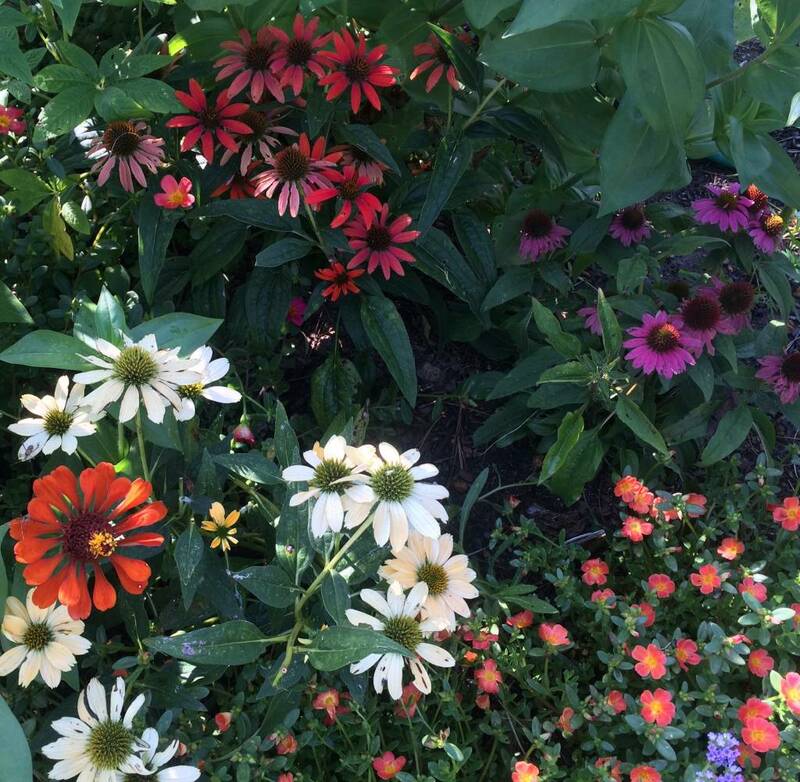 I began by planting a few foxglove, delphinium, and bachelor buttons under the still blooming summer tithonia. Then, when it was finally pulled out (Better late than never too! 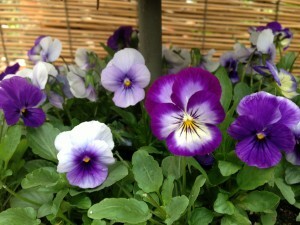 ), pansies, violas, and sweet alyssum were added to large spaces that opened up. Since the summer annuals were pulled out of them first, the two front beds were planted the earliest with snapdragons, poppies, bachelor buttons, chard, curly parsley, dill (The dill will eventually freeze at some point. 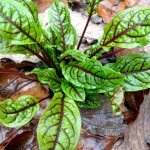 ), red veined sorrel, ‘Bull’s Blood‘ beets, kale, and mustard “Red Giant“. 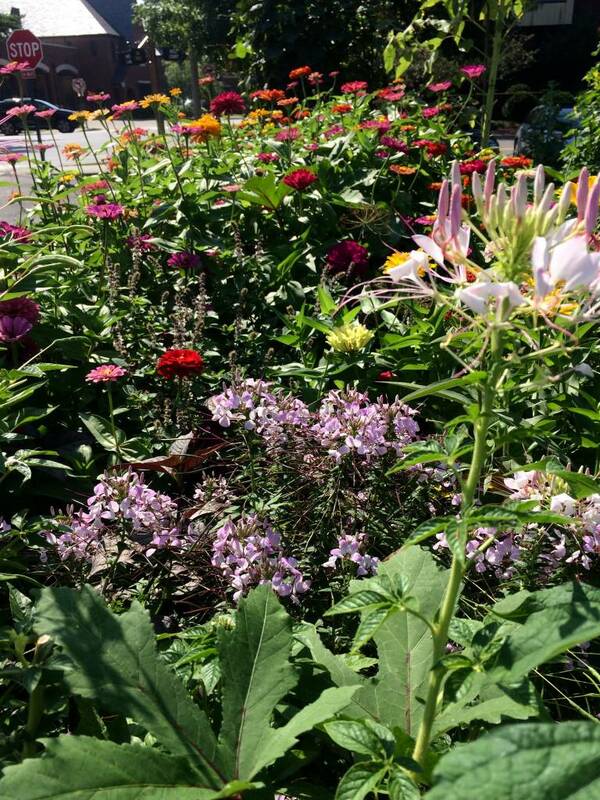 There’s quite a mix of annuals, herbs, flowers, and even bulbs (dwarf narcissus and ipheion) in each bed. 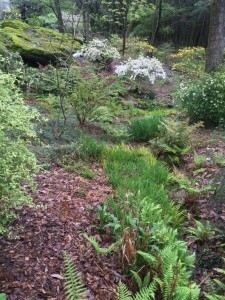 A good layer of mulch is really important for your winter garden. 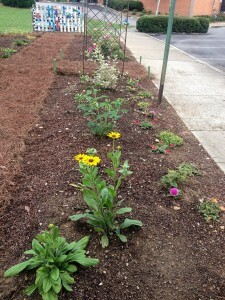 Some folks start with a completely empty bed, add the mulch, then plant through it, a great method and easy to do. Of course, I did just the opposite. 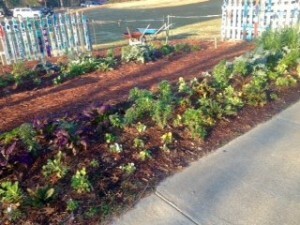 I had the time to plant before I had the help for the mulch! So, inevitably, there I was, mulching in the dark before the first cold snap of the season. 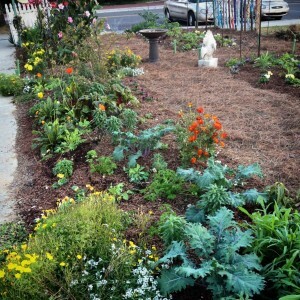 I also made sure everything was watered well before spreading the shredded pine bark around the little plants. There will be many more cold snaps before the winter is through, and I’m counting on this mulch to keep the soil warm since this isn’t a garden that gets babied. For people that don’t have big blocks of time (That’s most of us, I think. 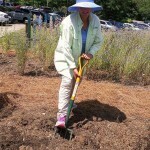 ), planting a little bit at a time does work…obviously I’m a poster child for it. Now I’m concentrating on keeping winter weeds controlled in the beds, since the two worst offenders, chickweed and henbit, insist on coming up. Don’t let these winter weeds get hold in your garden. Pulling a few every week is far more preferable than tackling them come spring, after they’ve been allowed to smother your pansies and violas. Have you planted some flowers for spring? 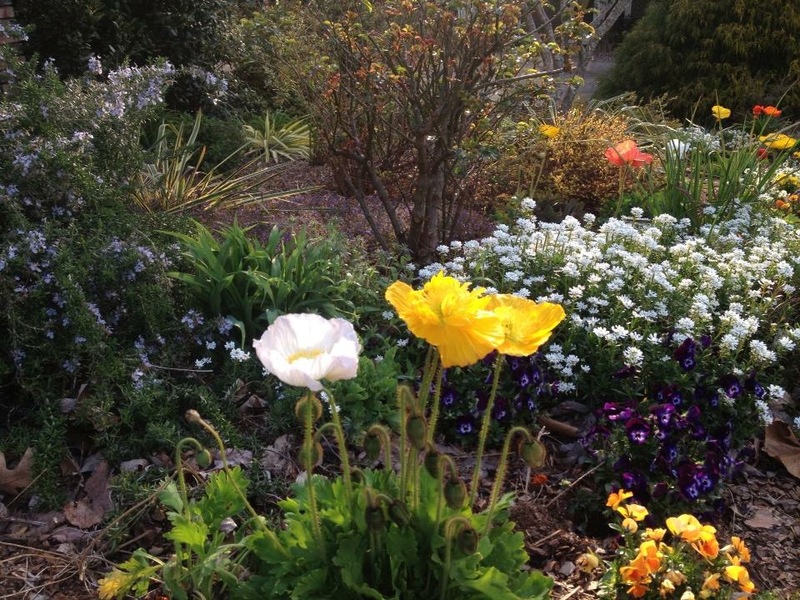 If you haven’t, try a few poppies, pansies, or violas since, as you know now, it’s never too late to plant a garden. I’ll keep you posted on our ‘better late than never’ garden’s progress too! This entry was posted in Annuals, Bedding Plants, Bulbs, community garden, Flowers, Garden Preparation, January, Planting Tips, Spring, Winter and tagged bachelor button, better late than never garden, curly parsley with pansies, emmet o'neal library community garden, fall planting, iceland poppies, ipheion bulbs, ornamental kale, pansies, planting foxglove, planting snapdragons, plants for a winter garden, red giant mustard, red veined sorrel, violas, winter annuals on January 3, 2015 by Kris Blevons. So many folks have stopped me, asking for a plant list of flowers in the “Better Late Than Never” garden, that I decided it was high time I posted this for those of you who’d like to have something similar next year. Obviously our garden is sited in full, daylong sun, so plants were chosen with this in mind. You’ll need to provide at least 4-6 hours of sun, with regular watering and deadheading, to maintain your flower garden next year too. 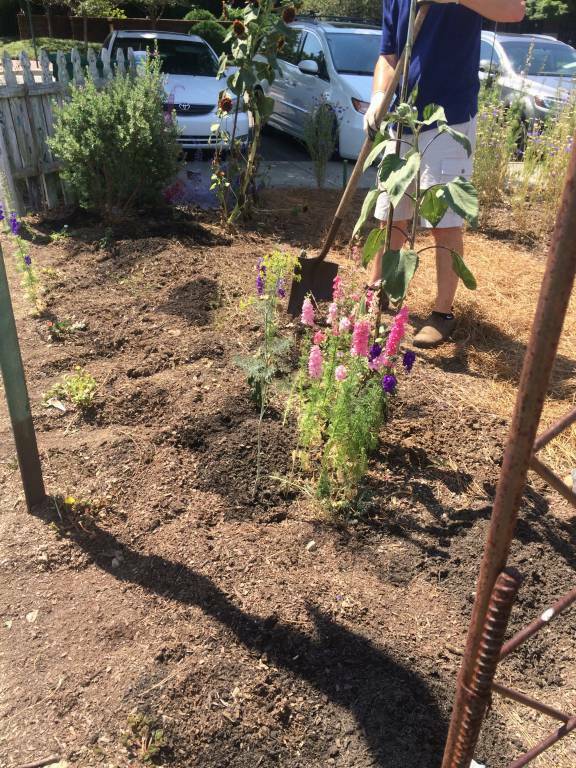 Any good garden begins with good soil, and, with previous vegetable garden plantings, ours had been amended with soil conditioner, compost and added topsoil. This past season we also added bags of PlantTone as well, raking it in lightly. No tilling was done since that tends to turn up weed seeds, and, once they hit the light, they all sprout, turning the garden into a weedy mess! In a previous post I mentioned how late the garden was planted (not until the end of June! ), so it was incredibly hot when the sunflowers and zinnias were planted by seed. This is actually very good, since they need very warm soil to germinate and grow happily and consistent watering as well. I know many of you thought we were a little crazy to be planting in the incredible summer heat, though. (This is a good time to remind all of you to wear a hat if you’re out in the heat and sun and be sure to provide water for yourself too!) 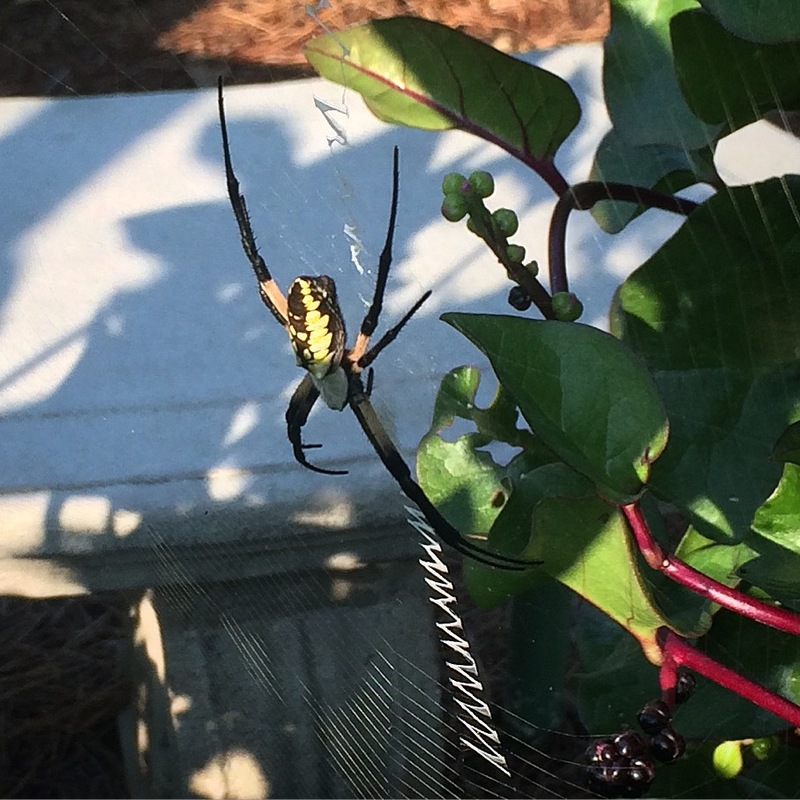 Here’s a post highlighting how much the garden had grown by late summer. So many of you talk about how it seemed to explode overnight. Actually, it was steadily growing each day! 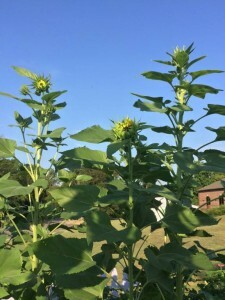 Sunflowers – We raided our Botanical Interests seed rack and planted a mix of sunflowers from Lemon Queen, mixed packs, and solid reds and yellows directly into the ground, then waited, impatiently, checking them every day – and watering each day – until they sprouted. Watching them grow and seeing folks taking pictures made all the effort worthwhile for these towering beauties. 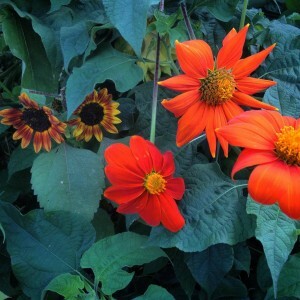 Tithonia, Mexican Sunflower ‘Torch’ – These also were planted from seed at the same time as the sunflowers. 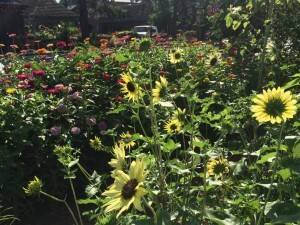 At first the sunflowers eclipsed them, but, by the very end of summer after the sunflowers had played out, the Tithonia took over, and everyone was asking about it. 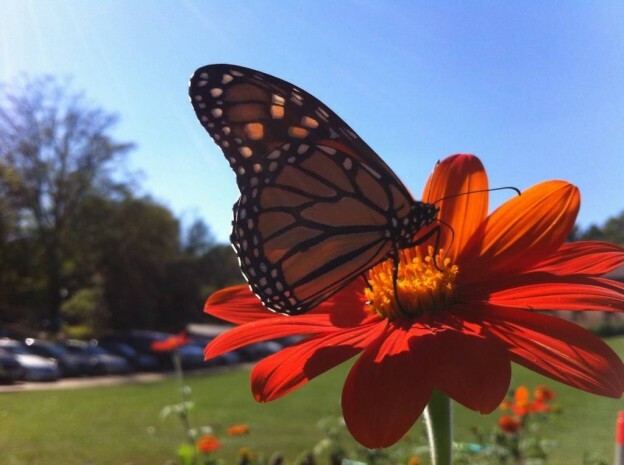 It boasts never-ending orange flowers that attract yellow sulphur, skipper, painted lady, and, finally, at the end of the season, monarch butterflies. 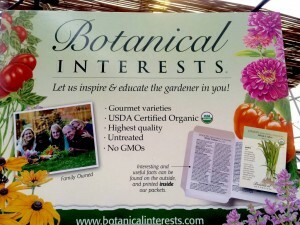 A must for any sunny flower garden. I kept it deadheaded and staked but left some to lean and sprawl since the stems got quite large. 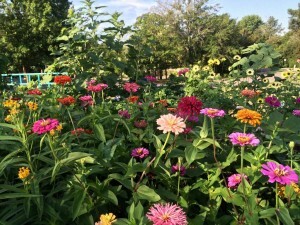 Tall cutting zinnias – The zinnias were also planted at the same time as the sunflowers and Tithonia. Again, we used Botanical Interests seed leftovers on the seed rack – all mixes of tall varieties. We also had a few green ‘Envy’ zinnia plants in cell packs left over from spring. 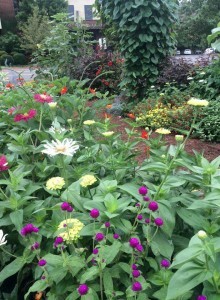 These I cut back by half and planted in the front two beds while we waited for the zinnia seeds to come up. 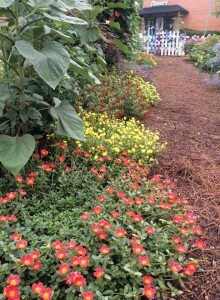 As seedlings came up I pinched them back to promote branching, and they were kept deadheaded to promote more blooms so everyone could enjoy the flower display. Hibiscus – There were two hibiscus varieties planted in the garden. Unlike fancy big-blooming hibiscus you may be more familiar with, these were planted for their foliage appeal, with blooms being secondary. The first is an ornamental red leaf hibiscus, and one of these was planted on each side of the back arbor. 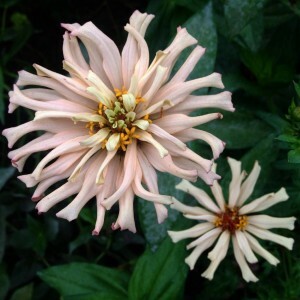 By the middle of October, they had each grown to enormous proportions, adding another depth of color to the garden, growing up through the tithonia and moonvine. I kept them clipped periodically to keep them in check and in proportion to the rest of the surrounding plants. The second was a variegated ornamental hibiscus. One of these was planted on each side of the front arbor and had pink gomphrena and tall cutting zinnias growing through it. 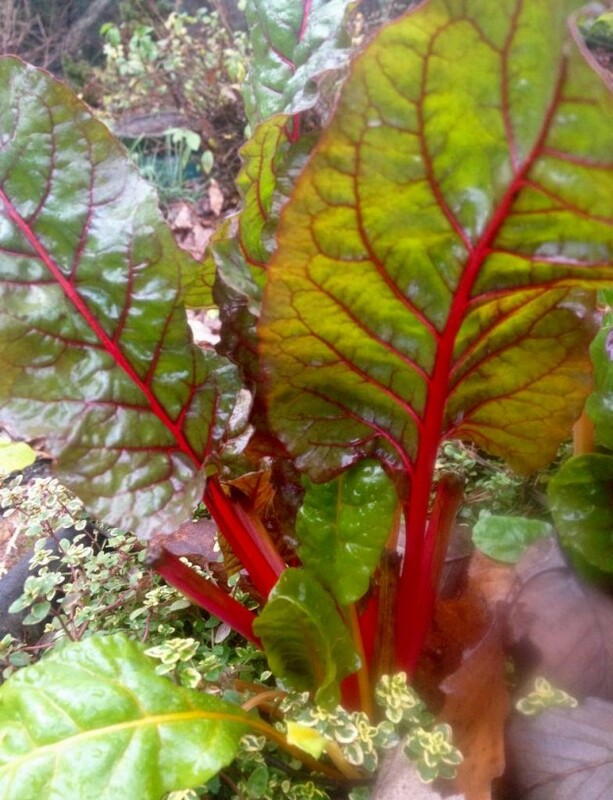 They were not as vigorous as the red leaf but still added another leaf variation in the garden. Gomphrena – A plant I wouldn’t be without in the flower garden. It never looks like much in a pot, but in the garden its globe-like flowers add a completely different silhouette among all the daisy-like blooms. And it is tough! 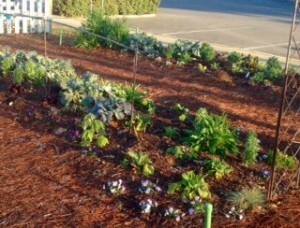 We planted transplants of tall purple, red, and pink gomphrena and also added a short variety in all four beds. Here’s another post that features gomphrena. Purslane – This low-growing, succulent-like annual is an amazing bee magnet. 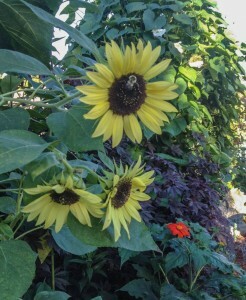 We had literally hundreds of honeybees each morning on the bright yellow, orange, and red blooming plants. 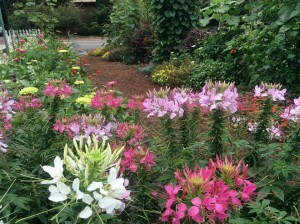 They are best planted along the edge of hot, sunny beds. The flowers close late in the day, but that’s hardly noticeable if you provide other flowers to look at! Be sure to take a look at the video of the honeybees on our YouTube page. Cleome (Spider Flower) – We had a flat of scraggly looking cleome left over from spring that needed a home…and what a home it got! I cut them back by half so they would branch and be fuller, and were they ever! Don’t hesitate to cut back stems of these flowers through the summer. When you see numerous seed pods hanging down the length of the bloom, it’s time to cut them back. Don’t worry; they’ll continue to bloom and will probably reseed next year for you. 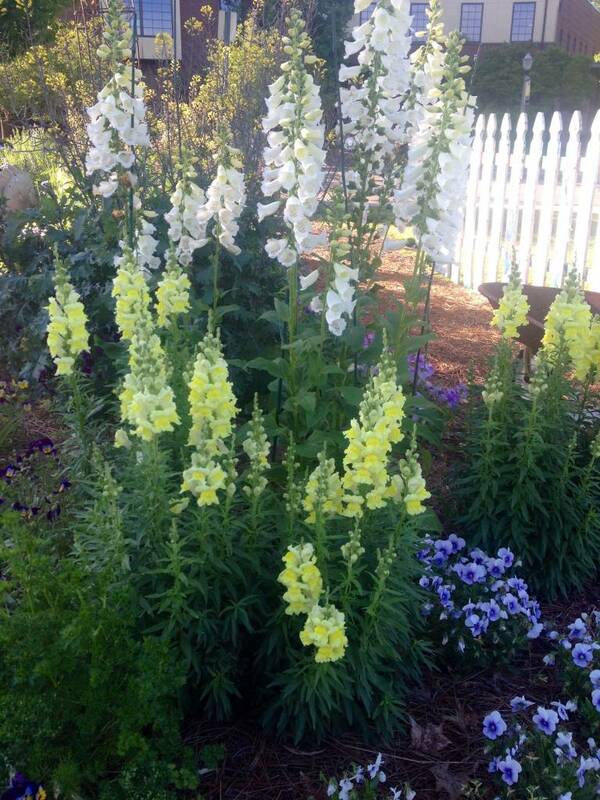 Old fashioned flowers, they attract butterflies and bees too. Porterweed – An interesting plant that sends out long bloom spikes with blossoms the hummingbirds and sulphur butterflies adore. I would plant it again for that reason alone! I was also impressed that it never seemed to be bothered by insect pests. Cuphea llavea, Red bat face cuphea – You may not have noticed this plant right away, but the hummingbirds sure did! 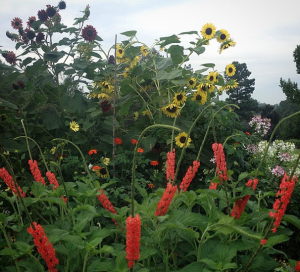 Planted along the front of the sunflowers and under the tithonia, it added a shot of red along the ground. Extremely tough and virtually carefree, it flourished with less than optimal sun, as it eventually was shaded out by the towering sunflowers. Even so, it was one of the last things removed at the end of October. Cuphea ignea, cigar plant – Another planted for the hummingbirds. 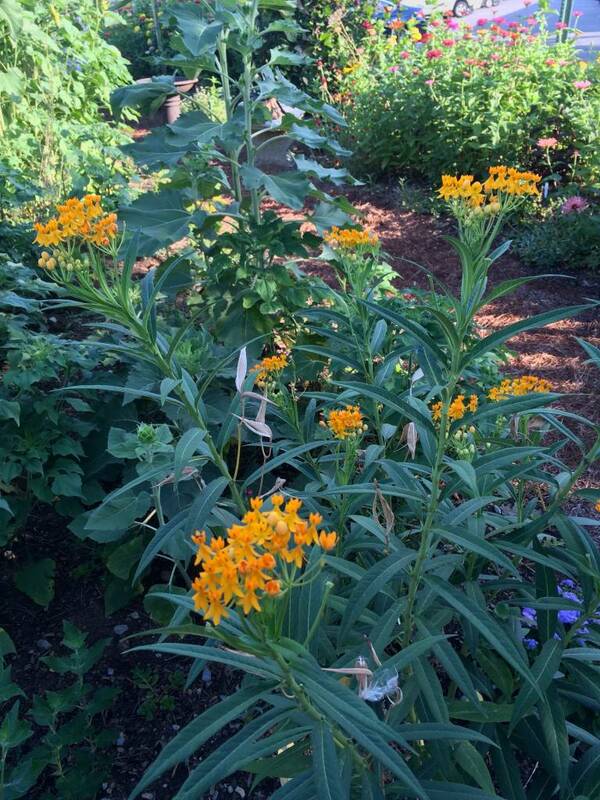 This one sports orangey tubular flowers on a rangy plant that I put right in the middle of the zinnias. 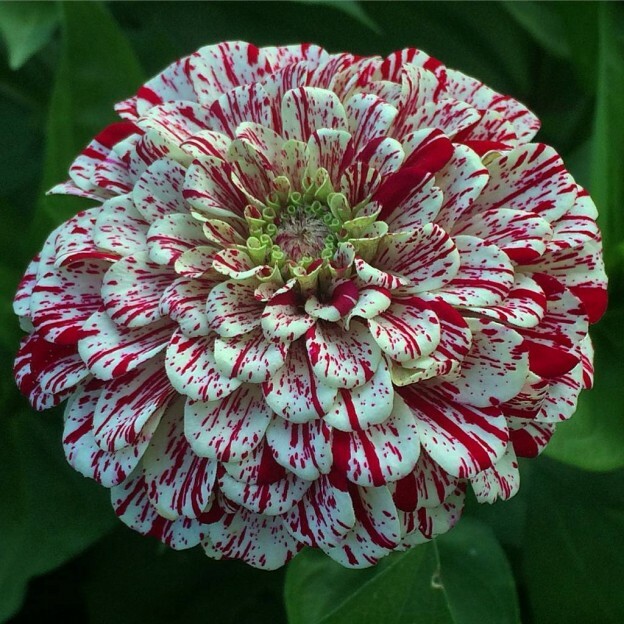 This post tells you more about this unusual plant. 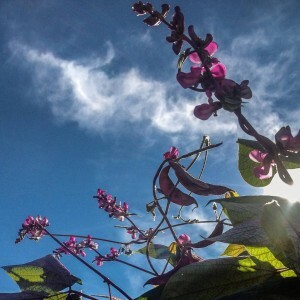 Hyacinth Bean Vine – We started the hyacinth bean vine from seed, planting them all along one side of the front arbor, then waited and waited for it to come up. It finally did, but the leaves were being chewed to pieces and it didn’t look happy at all. Since the garden is pesticide free, the offending leaves were removed and it was given liberal doses of Annie Haven’s Authentic Brand Manure Tea. Gradually it grew stronger, whatever was chewing it moved on, and buds began to form. By September everyone was asking what the beautiful purple flowering vine was. 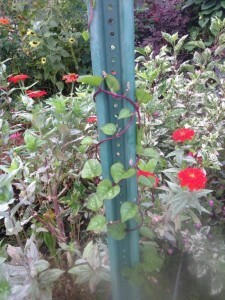 Moon Vine – The moonvine was planted on the back arbor and was the last one we had in stock from spring (They’re easily grown from seed too.). For the longest time, it seemed to be all leaves until buds began to form late in the summer. Just about the time it threatened to engulf the arbor and everything around it, the fragrant nighttime blooms began to open each evening and were still open each morning. 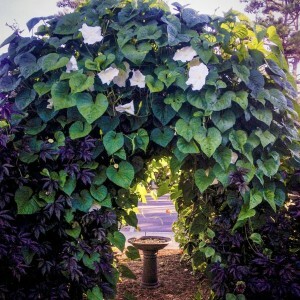 Mandevilla Vine – A red mandevilla was planted on one arbor on the other side of the moonvine, and a pink mandevilla was planted on the arbor on the other side of the hyacinth bean vine. The pink mandevilla was still growing strong at the end of October. The red mandevilla was swallowed up by the moonvine! Both are heat-loving vines and quite beautiful and carefree. Cuphea hyssopifolia, Mexican heather – Yes, yet another Cuphea and one for the bees. This one is a mounding annual that’s just right for filling in spots toward the front of a flower bed. 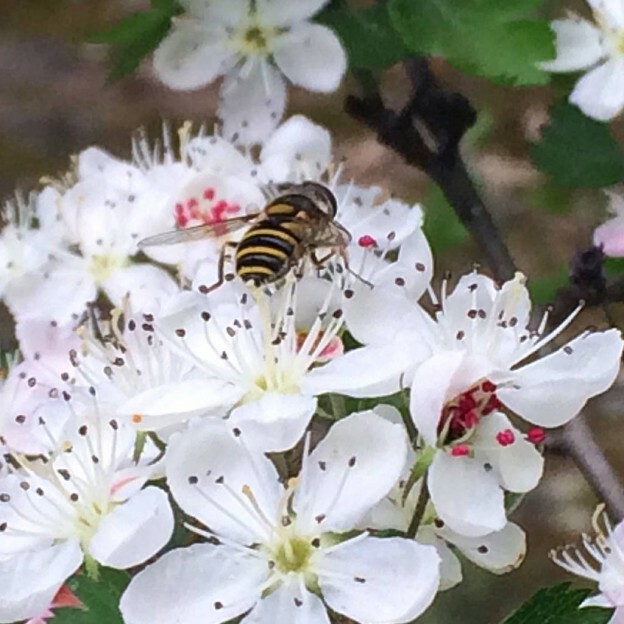 Bees love it, and it’s virtually maintenance free. Otomeria – A plant I’ve never grown before this summer but that was very impressive in the garden! There were only two, and you may not have noticed them. They love our heat and hopefully will be available for you to try next summer. 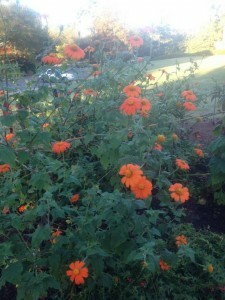 The two in the garden were planted in August and bloomed until the end of October, when they were finally pulled out. They offered clean white blooms on sturdy mounding plants. 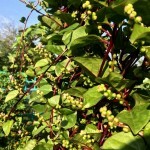 Malabar Spinach – Not spinach at all, but an edible and heat loving vine with pretty purple flowers. Like the otomeria, this was another fun plant to try that was also new to me. 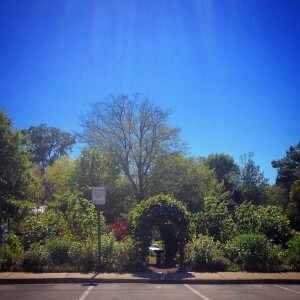 It did extremely well, planted late, growing up each arbor and up the very ugly 2 hour parking sign. 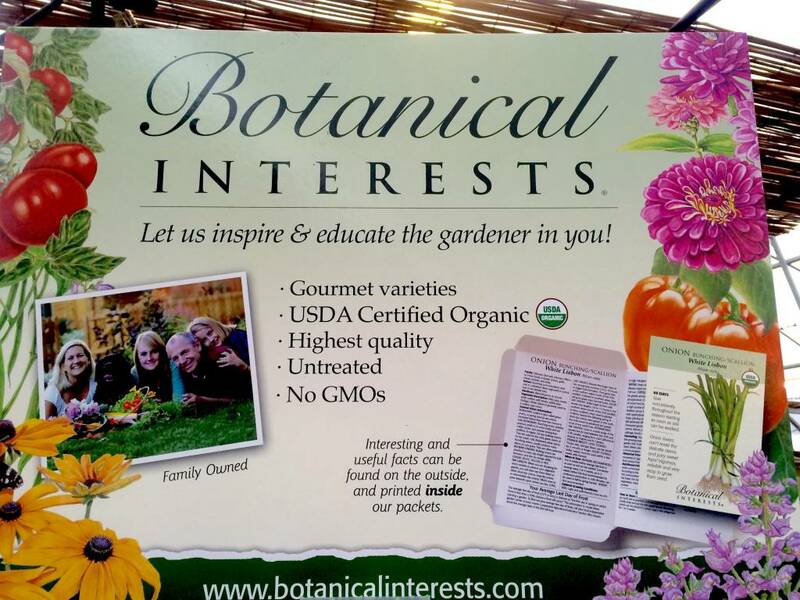 If you’d like to learn more about this fascinating plant, click HERE. Rudbeckia ‘Indian Summer‘ – A sturdy annual Black-eyed Susan with large blooms, I’m going to leave these in the ground in hope that they’ll come back next year. We shall see! 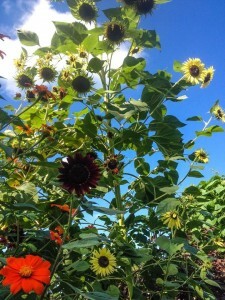 Lantana – A couple of lantana were placed at the back of the sunflowers where they’d get the most sun. They were planted quite late (August) so didn’t have much time to develop. I’m going to leave them in those spots to see if they’ll return next year. They might if the winter is mild enough. Assorted tip cuttings of succulents were placed at the front corner by the sign and began to really take hold by the end of the summer. A rosemary plant was left in from the previous garden and a perennial Cardoon was placed on the end of one bed for its spiny, silvery foliage. 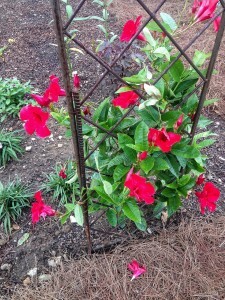 A few dwarf purple ruellia, Mexican petunia, were added by the back rose arbor. Finally, a couple of shade-loving torenia were planted under the sunflowers (They were just right to see from a child’s perspective!). So, there’s your plant list if you’d like to have a similar summer garden next year. Please don’t feel tied to just these plants, though. So much of the joy of gardening involves trying new things and discovering how they work in your landscape. Meanwhile, for now, our winter garden is being planted gradually and offers an entirely different set of possibilities, again some from seed, others from transplants. I hope you enjoy the view! This entry was posted in Annuals, community garden, Flowers, Garden Design, Garden Preparation, Planting Tips, Soil Amendment, Succulents, Summer, Tropicals, Vines, Watering and tagged annie haven authentic brand compost tea, bat face cuphea, better late than never garden, butterfly gardening, cleome, community garden, cuphea, cuphea ignea, cutting zinnias, gomphrena, Hyacinth bean vine, malabar spinach, Mandevilla, mexican heather, Mexican sunflower, milkweed, monarch butterfly, moonvine, oak street garden shop flower garden, ornamental hibiscus, otomeria, painted lady butterfly, planting for bees, porterweed, purslane, red leaf hibiscus, Rudbeckia 'Indian Summer', spiderflower, sulphur butterfly, sunflowers, tithonia, variegated hibiscus on November 4, 2014 by Kris Blevons. 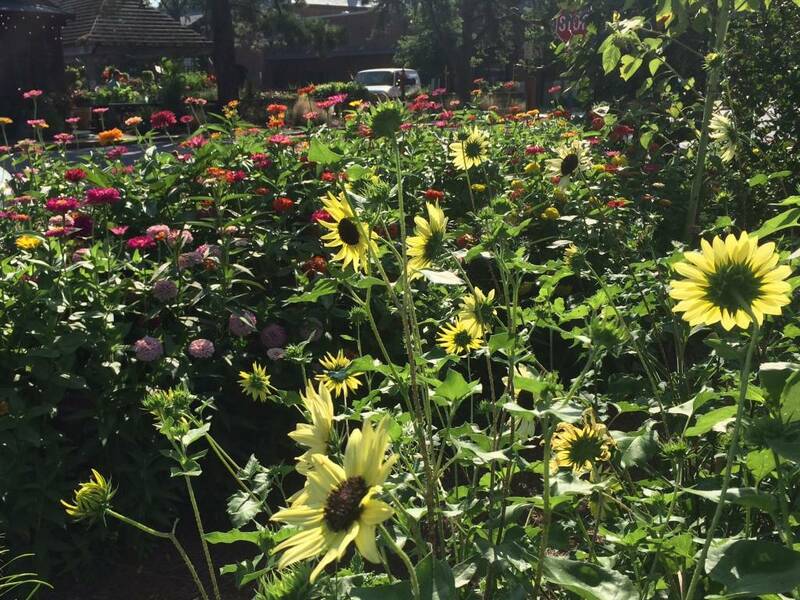 Our Garden – This Year It’s Full of Flowers! Last fall we planted the garden across the street from the shop with all the combinations of pansies and violas we could pack into it, and it was beautiful until the first hot, pollen-filled days of spring arrived. Then it sat…the poor pansies getting more and more bedraggled as we got busier and busier helping folks plan and plant their own gardens and planters. Finally we had a little breathing time and were able to at least get the scraggly winter plantings pulled out; but, by then, it was already June! Clearly, something had to be done. We certainly couldn’t be a garden shop with no garden! So we began to plan our summer garden. We decided this year it would be filled with flowers and began to set some aside to plant along the edges of the four planting beds. 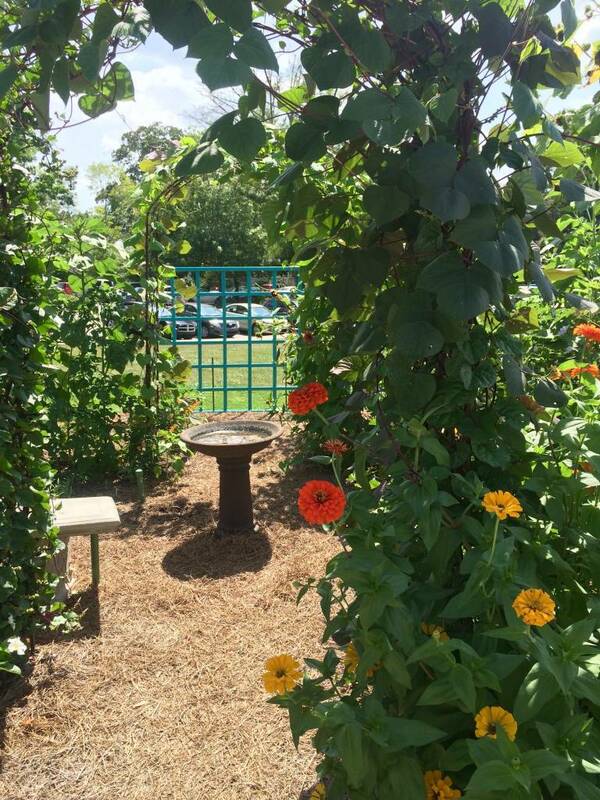 In the centers of the beds, we envision tall cutting zinnias, orange Mexican sunflowers (Tithonia), annual sunflowers, and nicotiana by seed (We’re keeping our fingers crossed they all come up!) and have some hibiscus planted as well. There are two arbors in the middle of the garden. On the largest we planted hyacinth bean vine seeds on one side and a pink mandevilla vine on the other. A red mandevilla and a moonvine are growing up the other arbor. Be sure to walk through in the early evening to watch the enormous, fragrant, pure white moonvine flowers unfurling. You can literally watch them slowly open, greeting the evening. 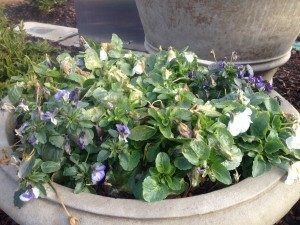 By morning their blooms are gone – rather like a morning glory vine in reverse. Jay added bags of PlantTone to each bed, raked it in, added a light layer of soil conditioner, and graded the beds to prepare them for planting. Because we didn’t want to expose a lot of weed seeds to sunlight, which would cause them to begin growing, we didn’t turn the soil. 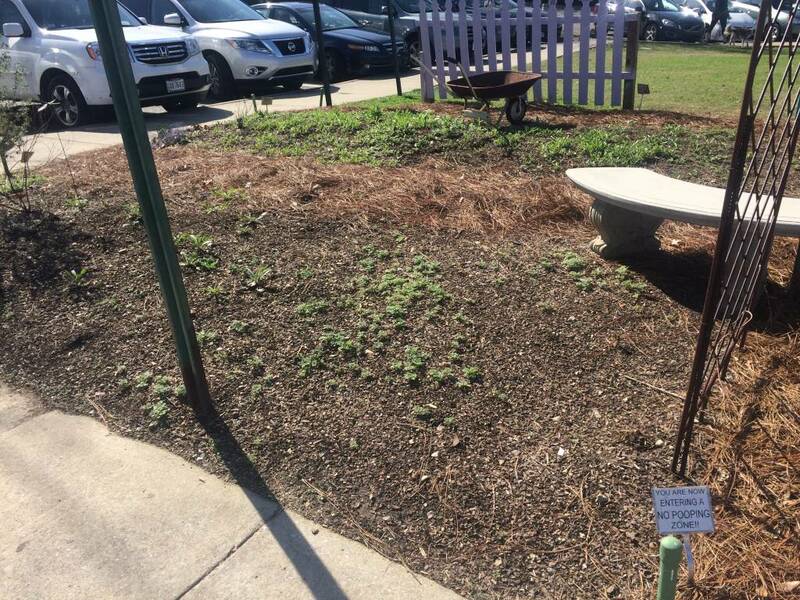 As the flower seeds emerge and we’ve thinned those that need it, we’ll add more soil conditioner as a top mulch to help conserve water and keep future weeds in check. Some of the low edging plants we used include purslane, red cuphea, mecardonia, gomphrena ‘Pink Zazzle’, and mexican heather. Plans are to also add some succulents at the front corner by the sign. 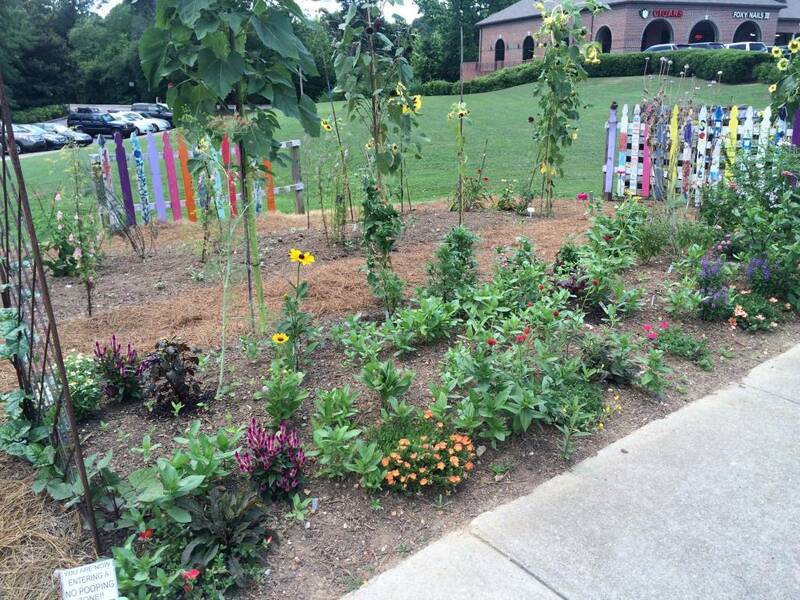 We hope everyone in the area enjoys our staff flower garden this summer. 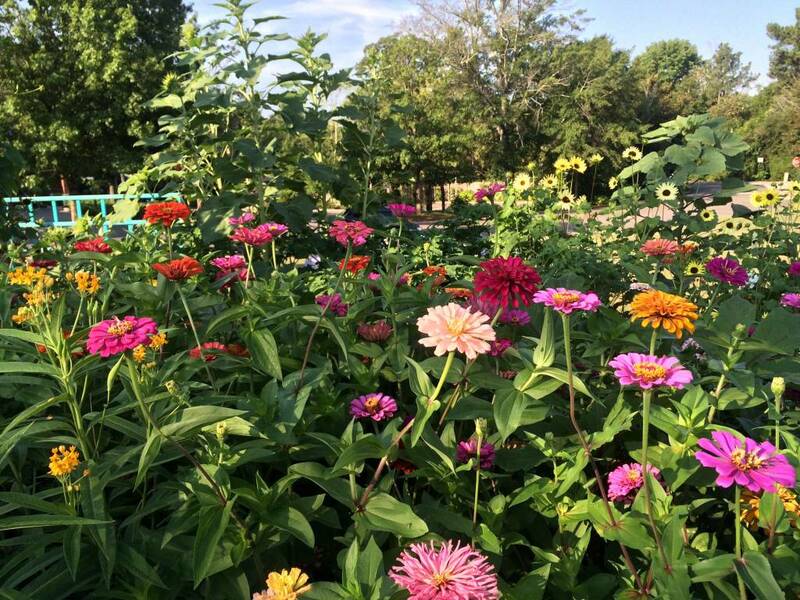 If you happen to be walking by, take a stroll along the paths, enjoy the flowers, and help pull a few weeds if you see them! 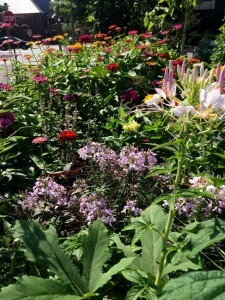 This entry was posted in Annuals, community garden, Flowers, Garden Preparation, Planting Tips, Seeds, Summer and tagged better late than never garden on July 2, 2014 by Kris Blevons. 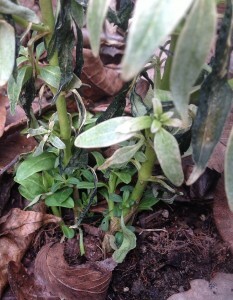 See the green growth at the base of this snapdragon? February is usually the month the temperatures begin to rise, though there is always the possibility of cold weather still through March. 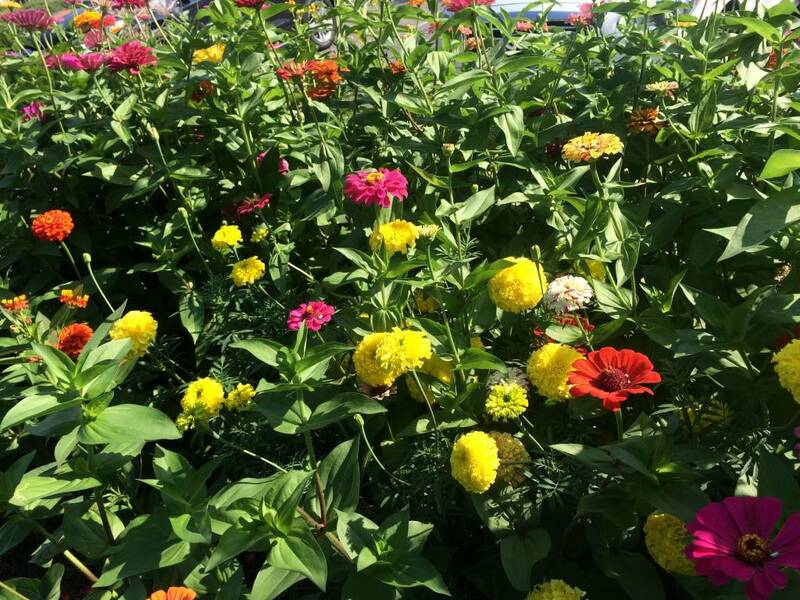 This year it’s definitely been colder than usual, and the pretty pansies, snapdragons, and other cool season annuals we all planted last fall have definitely taken a hit. Normally in February, regular deadheading (pinching off faded blooms) should be done to keep pansies and violas blooming well. 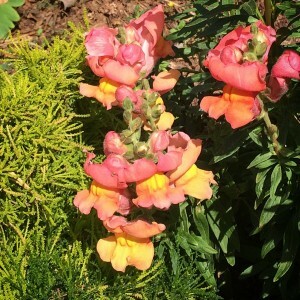 Many of the snapdragons you planted will still be green at the bottom, but have dead growth that needs to be clipped off. With temperatures moderating and even rising, they will begin to grow again. In fact, they may be prettier than ever late spring into early summer; think of the cold damage as a rejuvenating pinching back! 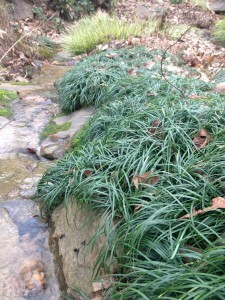 Mid-February is the traditional time to cut back mondo grass, liriope, and acorus in your landscape before spring growth begins. A string trimmer makes quick work of this job. Don’t wait too long to take care of this necessary grooming maintenance or you’ll risk damaging new growth. 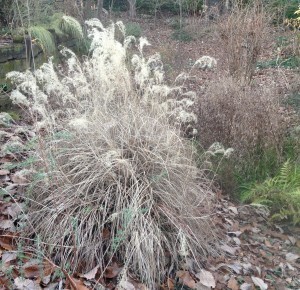 Do you have tall perennial grasses in your landscape? They should also be cut back now. The easiest way to address large clumps of grasses is to bundle them up with strong twine or a bungee cord, then, if it’s a small clump, cut it back with your hand pruners. Or, if the clump is large, use a power hedge trimmer and simply cut the entire clump to the ground. 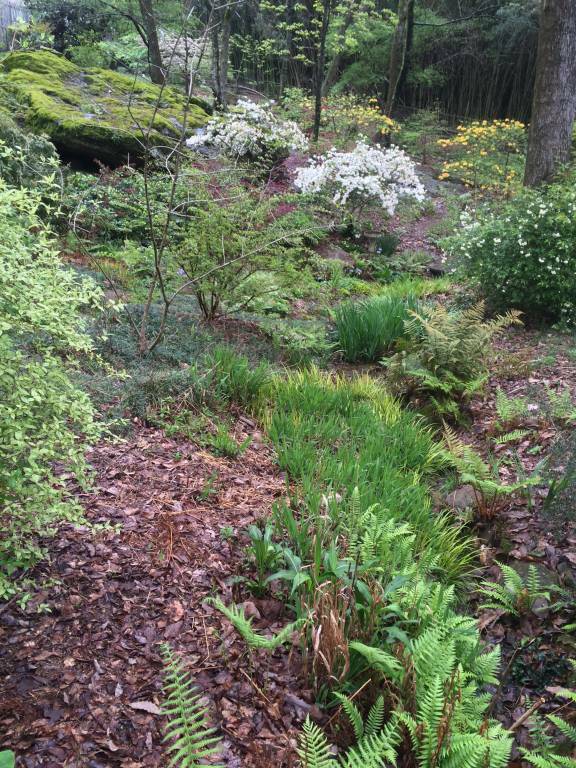 Again, don’t wait too long to tackle this chore or the new spring growth will already be up. Be very careful with these large perennial grasses; wear long sleaves to protect your arms and glasses to protect your eyes from the sharp grass blades. 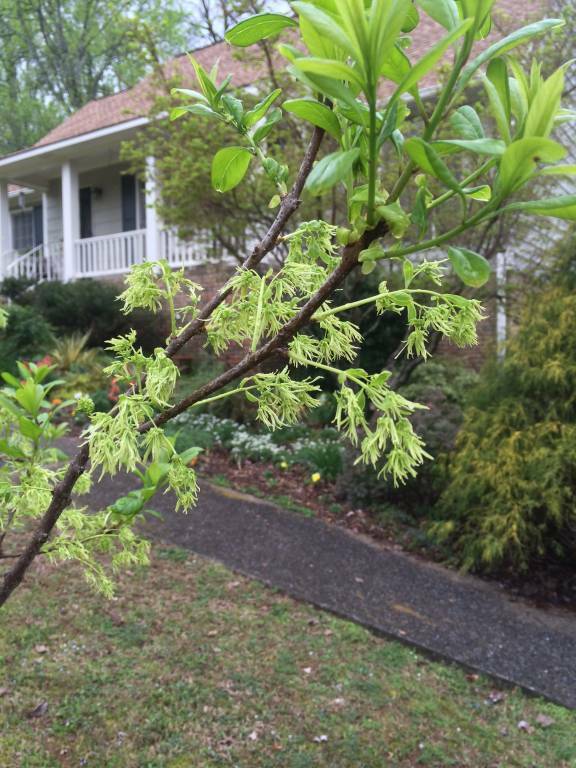 It’s still a bit early to fertilize shrubs and trees in anticipation of spring growth – that is best left for the end of March into April. However, if you didn’t shred your leaves this fall and work them into garden beds, resolve to do it this year. Adding any organic matter to beds helps loosen soil and provides nutrients, contributing to the overall health of your soil and microbes that live in it. 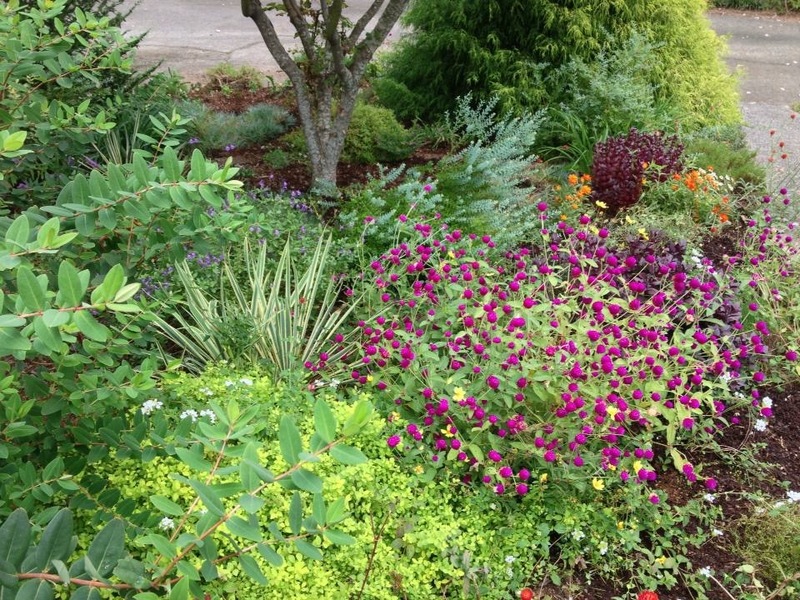 Have you been thinking about creating a new bed in your landscape? It’s a great time to do this as well. 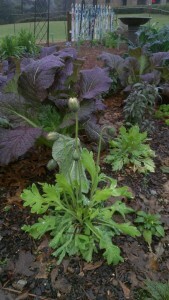 Perhaps you’d like to have a vegetable garden this spring. Even a small area of 4’x8′ can provide enough space to grow a couple of tomato plants or some peppers or a combination of a few different things. 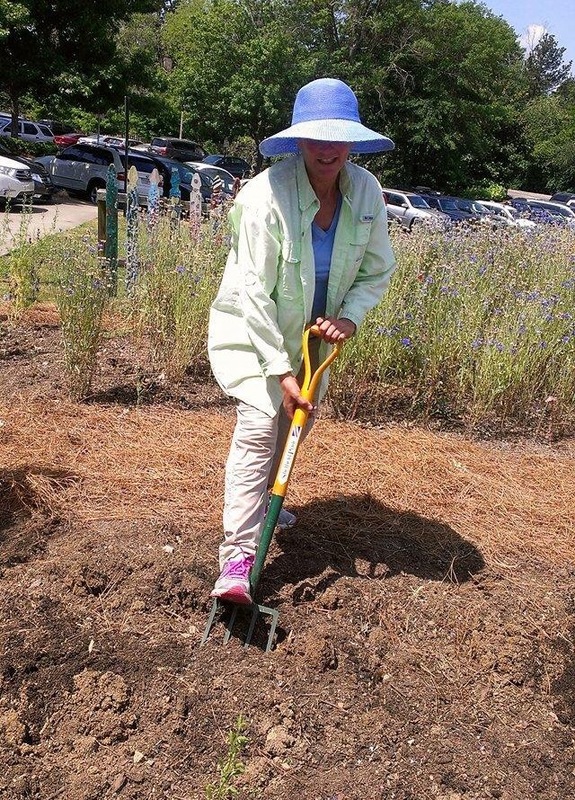 The one thing to remember when making a new planting bed is you must add organic matter to our clay soil – leaf mulch, cow manure, soil conditioner, homemade compost (Do you have a compost pile? You should!). Work as much organic matter as possible into your new bed. This will aid in drainage and soil fertility and make it easier to plant too! If you have old newspapers, these can be laid over the top of your bed and a thick layer of mulch or leaf mold placed on top. Not only does the newspaper smother weed seeds you may have brought to the surface but it will decompose – the perfect way to recycle your newspaper! 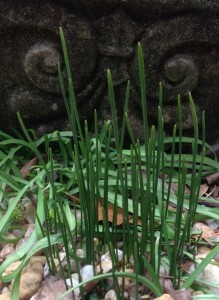 You may have perennial bulbs appearing in your garden. 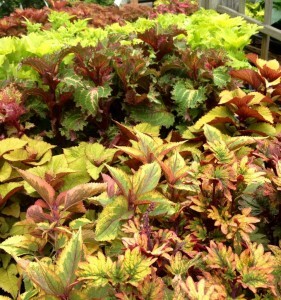 As this foliage emerges, it is the time to fertilize them with a bulb fertilizer. If they seem crowded and don’t bloom well, consider dividing into smaller clumps this spring. Taken a bit at a time, these tasks aren’t too demanding, and the deadheading, cutting back, and fertilizing will make your landscape shine! This entry was posted in Annuals, Bulbs, February, Fertilizer, Flowers, Garden Preparation, Planting Tips, Soil Amendment, Spring, Tree/Shrubs, vegetable gardening, Vegetables, Weeds and tagged bulbs, cutting back perennial grasses, garden bed preparation, garden chores february and march, pansies, spring, trimming mondo and liriope on February 18, 2014 by Kris Blevons.